If you’ve played and enjoyed the first two episodes of Glitch Games’ Forever Lost series, you probably don’t need much convincing to play the third. If you haven’t played the first two games and are a fan of point-and-click adventures, I highly recommending grabbing those right now and then picking up the third as well. For those who need more convincing than that, I’ll cover some of the finer details of the game. 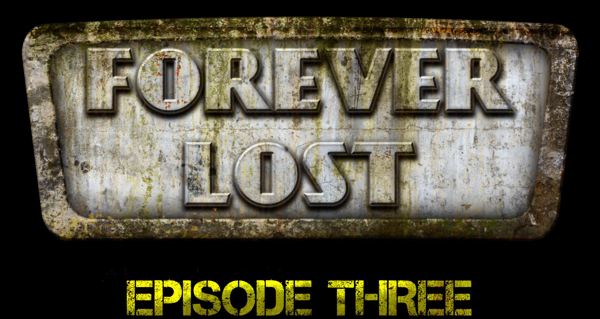 Forever Lost Episode 3 picks up where the last game left off. 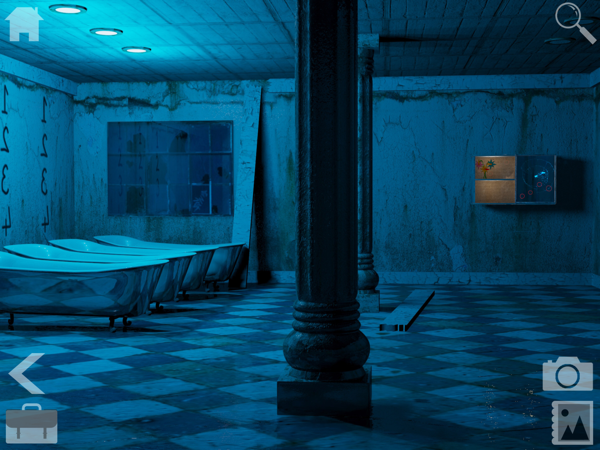 Unsurprisingly, you’re wandering around places like an old abandoned asylum, lost and confused, trying to figure out where you are and what’s going on. This is the final episode of the game and it therefore answers a lot of questions in regards to the story. But it also assumes you’ve paid attention to the story so far. So if the story’s important to you, a replay of the first two games would be a good idea as a refresher. But even if you just play for the puzzles and ignore the story elements, you’ll still have a great experience. And those who played the previous episodes will be happy to know that this one is much bigger and longer. The graphics in Episode 3 are sharper and more detailed than in the previous ones. 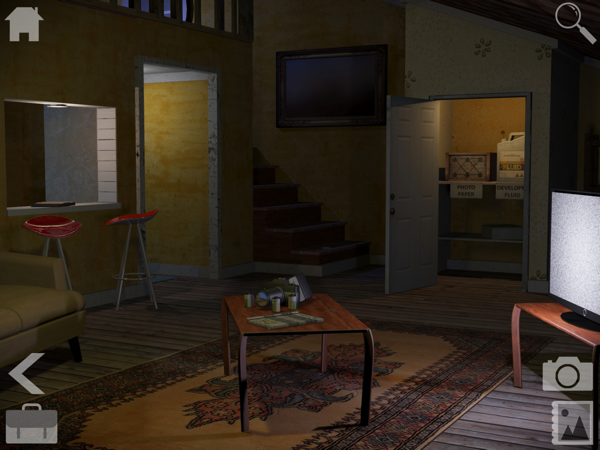 Those who played Cabin Escape will notice that the graphics are more in line with that game. The user interface is also the upgraded version we saw there. The cabin you escaped from even makes an appearance. But even though the graphics are sharper and more detailed, there’s still a gritty feel to them. Everything’s dark and lonely. But honestly, you don’t play Forever Lost to feel like you’re Indiana Jones exploring a lost temple. You play for the dark atmosphere, the clever puzzles, the quirky humor, and the hidden Easter eggs that are easily missed if you don’t pay attention. The mashup of dark content mixed with cheesy humor might seem odd, but it’s become the Glitch Games trademark. There are puns galore, both as puzzle elements and just for fun. 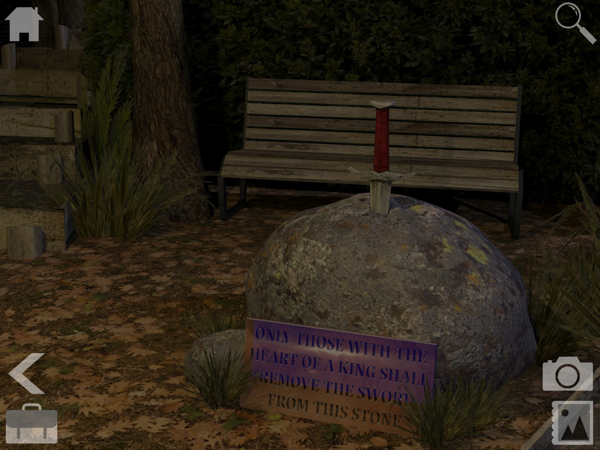 Also, many items are named after the developer, reminding you that you’re playing a game. It’s the Glitch charm that fans have come to expect. I used to get stuck on the pun-ny puzzles in their earlier games, but I’ve since learned to think like the developers. So instead of getting frustrated, I now usually just smile in appreciation. One of the things I love about Glitch Games is that they make sure every interactive object gives feedback in the form of text, either helpful, funny, or both. This way, you have some idea of whether it’s important or not. It keeps players focused, instead of just tapping wildly on every pixel until something happens. 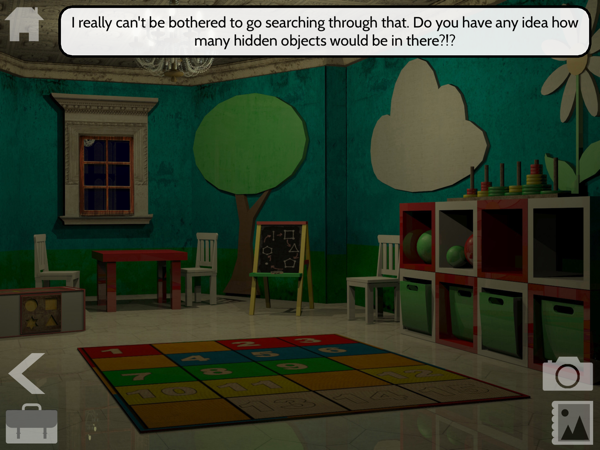 You really feel like you’re working towards solving the puzzles instead of just pixel hunting. It can be difficult to create that perfect balance where puzzles are challenging and fun without being overly frustrating, but Glitch manages to do so time and time again. Everything is logical. Even if you don’t figure out a solution on your own, the answer will make sense in hindsight. It’s hard to say which puzzles each player will find easiest or most challenging. I know some that I thought were very straightforward but other beta testers had trouble with. There were a few puzzles that had me truly stumped, but then I was kicking myself once I knew the answer because it made so much sense. You don’t need to read the developer’s mind to decipher anything. It all comes down to keeping your eyes and mind open as you explore. There are also a few puzzles that are more skill-based, but at least one of them offers a skip button if you have too many failed attempts. 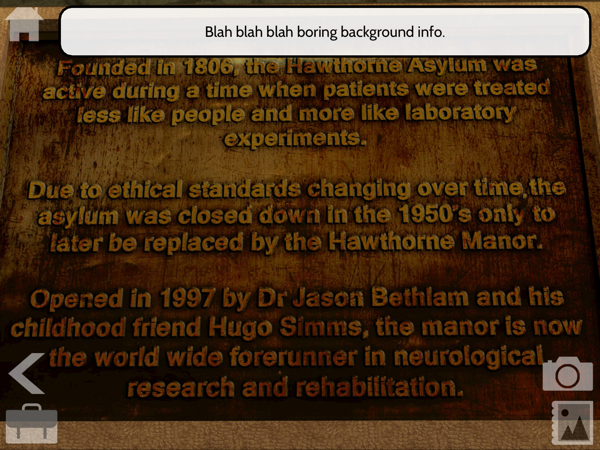 So even for those who like their adventure games to be a hundred percent relaxed, it shouldn’t be too much of an issue. There’s also a nice hint system in the game if you get stuck or you can try my step-by-step walkthrough for more help. 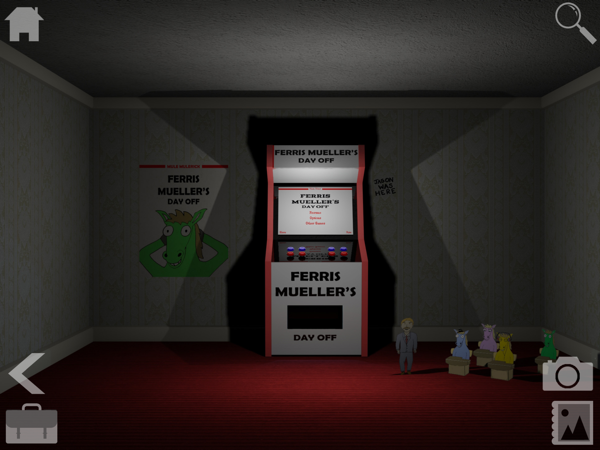 Glitch Games have a tradition of putting games within games and the latest episode of Forever Lost continues that trend, giving a little taste of one of their lesser-known titles, Ferris Mueller’s Day Off. It’s both a way to advertise the other game while also giving the player a change of scenery. I think it succeeds on both accounts and I hope it leads more people to playing their lighter, goofier game that was inspired by a typo of the movie Ferris Bueller’s Day Off. 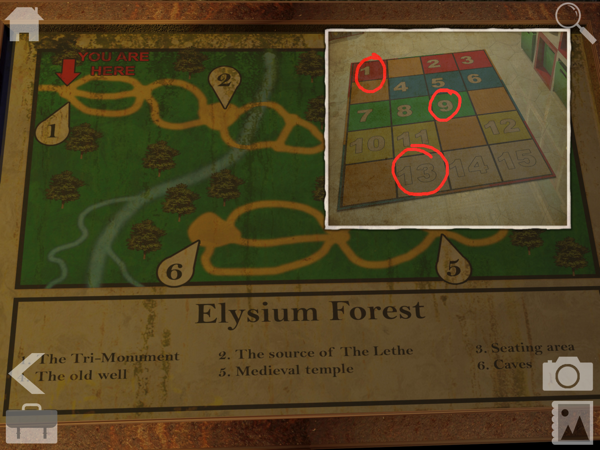 Since The Lost City started it, a lot of games have been using in-game journals that record any useful clues you find. These are great, but they do hold your hand quite a bit, telling you exactly what’s important. The Forever Lost games and other Glitch games instead utilize the Glitch Camera. This is essentially the same as having a journal, but instead of the game deciding for you what’s important, it’s up to you. You can snap photos of anything and everything, and then look through them to see what’s useful. Also, being able to take out several photos at a time while looking at a puzzle means you really don’t need to bother with pen and paper. You can even draw on the photos if you want. It’s such a simple and effective idea that makes you wonder why more adventure game developers aren’t using something similar. Another thing I love about Glitch Games is that they built an engine they named Serenity, which allows for lightning fast transitions between screens. The game involves a lot of backtracking, but it’s pain-free because you can scroll through several screens in less than a second (at least on my iPad Air 2). This makes exploration fun instead of a chore. If you miss something, it’s easy enough to go back and find it. 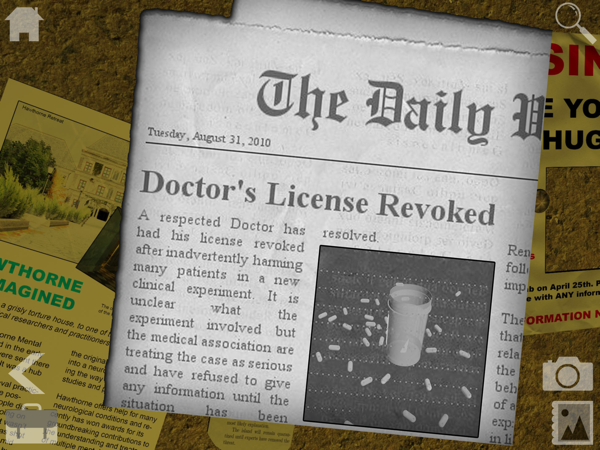 Basically, they remove all the frustrating aspects found in many adventure games and leave only the good stuff. The music in this episode is by Richard J. Moir and does a perfect job capturing the eerie, atmospheric mood of the environments. It cycles through about a dozen tracks, ensuring that it never gets old. There’s also some environmental sound effects like rushing water and even a bit of voice over work which is done pretty well. But for the most part, you’ll just be hearing the sound effects from actions you perform. It’s a quiet, lonely game by design. Now, I guess they couldn’t call themselves Glitch Games without at least one glitch in the game. The one I encountered is a minor one that didn’t affect my game the first few times I played. Basically, there’s a car that you drive and you can trigger something that causes the car engine sound to get stuck in a loop. It’s an annoying sound to keep hearing, but you can easily fix it by quitting to the home screen and then continuing the game. It did happen again with another sound, and when I paused the game, I lost the music altogether. But closing the app and re-opening it fixed that problem. So it shouldn’t cause you to lose your progress or anything like that. They’re also working on fixing it so it doesn’t happen at all, and it’s part of the reason the game got a bit delayed from the spring. So, to sum it up. If you’re already a fan of the Forever Lost series, you probably didn’t even bother reading this far because you’ve already downloaded and started playing the game by now. For everyone else, I highly recommend grabbing the game, especially after you play the first two episodes. This one is longer than the others put together and brings the whole series to a satisfying — if slightly ambiguous — conclusion. 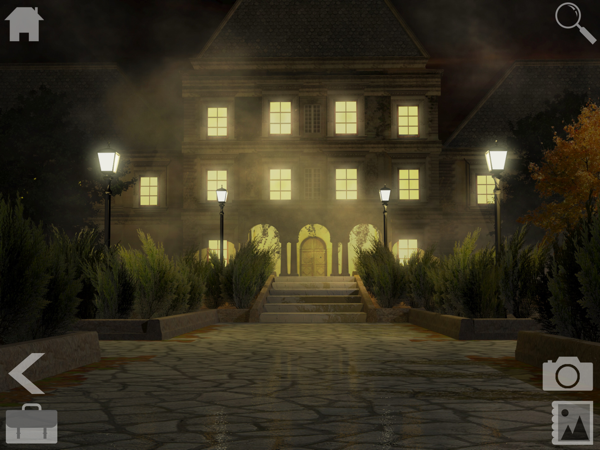 When it comes to iOS first-person point-and-click adventures, there are few who do it better than Glitch Games. So go grab the game here and start playing! If you’re already playing and need help with any of the puzzles, try my complete step-by-step walkthrough. Late last month we were treated to a new teaser video for the third and final entry in the Forever Lost point-and-click adventure game series.